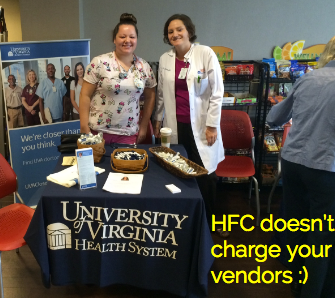 Health Fair Connections | Will HFC charge my vendors? To answer your question: No, we will not charge your vendors a single dime! Yet, we have a feature where you can easily invite them via the "Invites" section on your dashboard or you can use the "manually register" button to add them directly to your online vendor list. And trust us, you'll want to add your own list of vendors to your online vendor list. It's going to make the entire planning process much easier on you. Confirmation emails and text messages (the emails and text asking vendors to click a link to confirm their attendance). Your vendors will appreciate you letting them know about HFC, as they most likely would like to participate in more health fairs, not to mention have a FREE SEO'd profile where they can list their workshops, lunch'n'learns, screenings, and other corporate offerings.